Lord MacLean, born Ranald Norman Munro MacLean, is a graduate of the Universities of Cambridge (BA, Clare College), Edinburgh (LLB) and Yale (LLM). He has been a judge since 1990. He was admitted to the Faculty of Advocates in 1964 and appointed Queen’s Counsel in 1977. He served as an Advocate Depute from 1972 to 1975 and was Home Advocate Depute from 1979 to 1982. 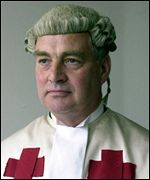 He has served on the Scottish Legal Aid Board, the Council on Tribunals and the Stewart Committee on Alternatives to Prosecution. Lord MacLean has been a member of the Parole Board for Scotland since 1998, a member of the Secretary of State for Scotland’s Criminal Justice Forum since 1996, and the Chairman of the Governors of Fettes College, Edinburgh since 1996. From 1988 to 1996 he was Chairman of the Council of the Cockburn Association. In January 1999 he was appointed Chairman of a committee whose remit is to review the sentencing and treatment of serious sexual and violent offenders including those with personality disorders.